Everyone, including the most die-hard of McDonald’s fan, would admit that McDonald’s burgers are not the healthiest option and are not good for our tummies. These burgers no doubt look attractive but they do inconceivable harm to our health. 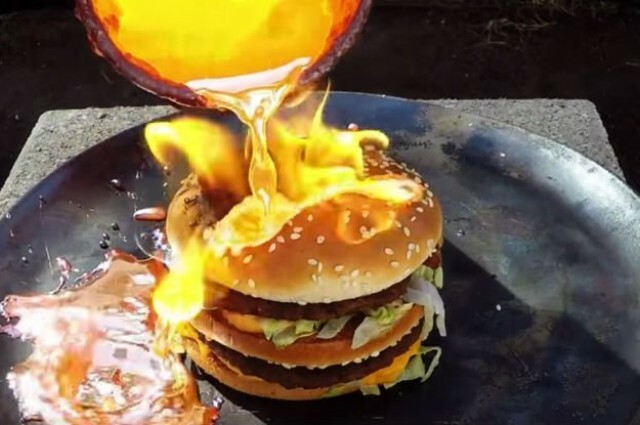 Tito4re, a YouTuber, experimented on a McDonald’s burger by pouring molten copper on it to show how indestructible and indigestible it is. This isn’t the first time he has done such an experiment. In earlier videos, he explored what happens when he pours melting copper on top of things like coconuts, ice, and tennis balls. By looking at this video, when a fluid at 1,085 degrees Celsius (1,984 degrees Fahrenheit) can’t quickly break down the burger, one may interpret what harmful effect it will have on a person’s digestive system. However, in this case, you can’t blame a burger. There is a scientific reason why the burger didn’t break down. The reason behind this is the Leidenfrost effect. This is a physical phenomenon in which a liquid, in near contact with a mass significantly hotter than the liquid’s boiling point, produces an insulating vapor layer keeping that liquid from boiling rapidly. In this case, moisture present in the burger bun boils on coming in contact with the molten copper, which produces a strong, insulating layer that initially protects it.